Phase-based motion estimation and magnification are targetless methods that have been used recently to perform experimental modal analysis (EMA) and operational modal analysis (OMA) on a variety of structures. Mapping the motion-magnified sequence of images into quantified operating deflection shape (ODS) vectors is currently being conducted via edge detection methods that require intensive human supervision and interference. Within this study, a new hybrid computer vision approach is introduced to extract the quantified ODS vectors from the motion-magnified sequence of images with minimal human supervision. The particle filter point tracking method is utilized to follow the desired feature points in the motion-magnified sequence of images. Moreover, the k-means clustering algorithm is employed as an unsupervised learning approach to performing the segmentation of the particles and assigning them to specific feature points in the in the motion-magnified sequence of images. 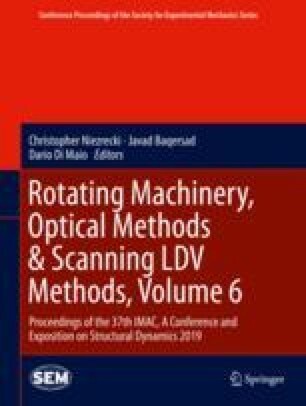 This study shows that the cluster centers can be employed to estimate the ODS vectors, and the performance of the proposed methodology is evaluated experimentally on a lab-scale cantilever beam and validated via a finite element model.